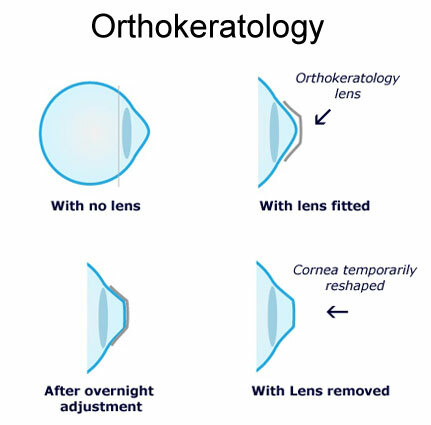 Orthokeratology, or Ortho-k, is a process that uses specially designed GP contact lenses to temporarily reshape the contour of the cornea to reduce myopia (nearsightedness). Orthokeratology is also sometimes called corneal reshaping (CR), corneal refractive therapy (CRT) or vision shaping treatment (VST). Some new ortho-k lens designs are also available for farsightedness and presbyopia. Research has also demonstrated that orthokeratology lens designs slow the progression of myopia. Good candidates for orthokeratology include children aged 8 to 12 with progressive myopia, as well as most adolescents and adults, although the best success is with people under age 40. Ortho-k is recommended for low to mild nearsightedness. People who are not good candidates include those with dry eye syndrome, a large pupil size, or high myopia. After a comprehensive eye examination, if you are a good candidate for orthokeratology, you will wear specially designed GP lenses at night only. In the one to two-week treatment period, your nearsightedness is gradually reduced. Since your vision will be changing, you’ll need to wear disposable soft lenses during the day. Once the treatment is over, you can wear the GP lenses at night only and see well during the day without any corrective lenses. You will need to see your eye care professional regularly to ensure your lenses are fitting well and your eyes are healthy. Since during sleep the lenses fit tightly on the eye, it’s especially important to clean and disinfect the lenses upon removal each morning. Young people whose nearsightedness is progressively increasing are often excellent candidates for orthokeratology. Studies have found that these specially designed ortho-k lenses can reduce existing myopia when worn overnight. As young people are very active athletically, this often allows them visual freedom to play sports without wearing eyeglasses or contacts. In addition to the benefit of lens-free daytime vision, orthokeratology is starting to be appreciated for its ability to slow the progression of myopia. A number of published clinical studies have found that orthokeratology lens designs inhibit the growth of the eye’s axial length, which determines the degree of myopia. If you would like to schedule an appointment with Dr. Roger Weikum or Dr. Tyah Johnson, please call (214) 220-2425 or use the button below to schedule an appointment online.